Since purchase.ie was founded back in 2009 we have always supported a charity in the run up to Christmas. Last year we raised in excess of 400 euro for two charities that help the homeless. See more information here. This year and on the instance of our Head of Security Ralph we have decided to support the Dogs Trust. 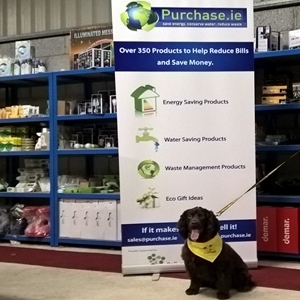 Purchase.ie Head of Security Ralph Insisted we support Dogs Trust Ireland this year! The mission of the Dogs Trust is “to bring about the day when all dogs can enjoy a happy life, free from the threat of unnecessary destruction“. Established in Ireland since 2009 Dogs Trust Ireland helped to rehome almost 3,000 dogs to loving families in 2015 and continues to grow from strength to strength every year. When you place your order with Purchase.ie between now and the end of December we will donate 2 euro to the Dogs Trust. If you insert the code Dogstrust2016 you will also get a small discount on your order.